September and October sees no let up, as having only recently returned from a very special performance at the Sydney Opera House (for the Sydney LifeForce Memorial Service onSuicide Prevention Day), the next few weeks has the band bouncing in and out of NSW, Victoria, then back to NSW for the Kangaroo Valley Folk Festival. Blue Mountains-based folk band Lime and Steel are hitting the road this month, making sacrificial offerings to the gods of automobile reliability and keepgoingability from Melbourne’s CBD up the east coast to Brisbane planned (with a stop-off in the nation’s capital). Lime and Steel began as a rootsy folk duo of Paddy Connor and Ben Scott, but over the years, their composition has changed, and indeed, their compositions have changed. Look, as much as a banjo and a set of uilleann pipes are going to keep you firmly catalogued under ‘F’ for ‘Folk’, if you go and add a pub rock drummer and a jazz bass player, you’re bound to start to develop a stellar groove somewhere along the road. Paddy says that the band definitely has a love for bluegrass and Americana (with two-fifths of the lineup from the US of A, that’s more or less inevitable), but always with an Australian intonation. Anyone who’s seen or heard Lime and Steel will know that their music is delivered with a generous scoop of political commentary, though Paddy feels this comes across more in the stage banter and intros than the actual songs themselves. The last two years has particularly provided an embarrassment of riches for pondering our political landscape. Lime and Steel are on the roll with their current record, Won’t Back Down, and to tell the tale of it, is to recite something of an epic ballad of its production and realisation. “We took quite a few hits at it, and there were some major obstacles along the way. A [band] baby was born, the studio was at one point evacuated for bushfires, our recording producer (jazz musician Neil Duncan) got cancer and ended up with an arm amputation. We had to persevere! Lime and Steel are equally suited to both the festival scene and to intimate pub gigs, as anyone who’s seen them at The Turning Wave Festival, or The Old City Bank in Katoomba can attest. They’re also having a secular world-sized punt on attracting a crowd to the re-imagined Smith’s Alternative venue in Canberra on the evening of the AFL Grand Final, so they’d love their Canberra fans and newbies to get along to that one. Pop in after Floriade? When I found out on 2nd January that Big Erle were playing the Volunteer Party, I was in raptures. The festival aficionados that you might only ever get to see once a year at thatfestival, or a number of specific festivals. Memorable moment: Seeing David Francey sing “The Lock-Keeper” live. Song for Woodford 2014-15: “Little Bag” by Lucy Wise Trio. 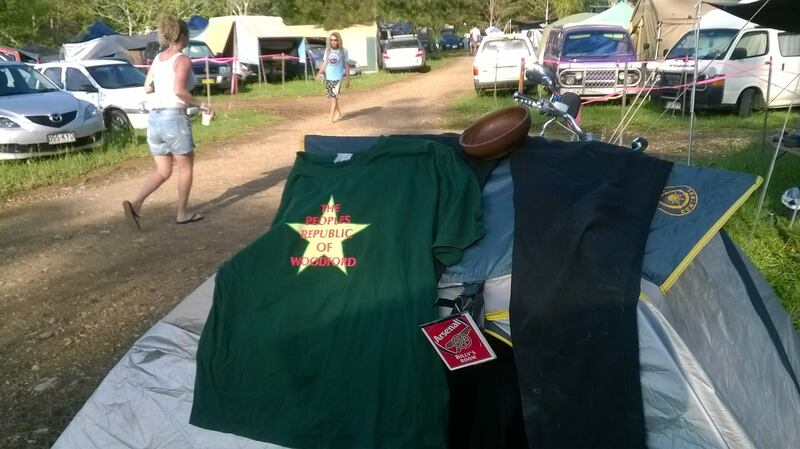 But as I left my then Canberra base, with one foot out the door, the phone rang and it was then MC Convenor, now Queensland Folk Federation president Rose Broe, telling me who I had on my rota to MC for. Tripod, Sarah Blasko, Ernie Dingo, Eric Bogle (twice). And John Schumann (twice). I was going to walk out on stage and introduce my absolute god of music of 25 years plus standing. And she is. Because (as I’ve written extensively elsewhere), she went on stage and was herself. Natural. No artifice. Mixing with the vollys, gathering in the then (and still) just on the adequate side of adequate Volly Centre, where you got to recreate scenes from The Good Earth by traipsing through mud to get there! Did we care? Not a jot. It was fun, it was wet, it was wild. I came back the next two years running, and lapped up every second. Volunteering is THE best intro to a festival, especially for the slightly or very out-of-pocket, and definitely for the sole traveller. At my second Woodford, I met the guys from the Tokyo Bar and made friends and compadres for life. After a five year break, it was a sheer delight to be co-located with them again, even though I went there on a media pass this year. On the night of 2 January, when the punters have gone home, the musos have moved on to their sideshows and petrol money gigs, and the stalls are coming down, the last bar standing (this year, the Bazaar) pumps out slightly cheaper drinks, a couple of bands are roped in to get a little bit nutty and let everyone let their hair right down, and there’s something of a feeling of ‘get down and maybe not get up again’ in the air. And there are speeches. Or really, just the one speech this time, with a miniscule intro. You can hear my surprise on the tape, as I did not know that my former boss (of sorts) and mentor is Ms Prez now. You would only expect an MC wrangler to speak with credibility, authority and clarity. Rose Broe knocked it out of the park. Even with a large furry animal half way down her ‘festival throat’. If like me before Easter 2005, you’ve been sat back sucking the air in through your clenched teeth at festival ticket prices due to your current financial circumstances, have a good hard look at volunteering. We need our paying punters, but festivals would be nowhere without an army of volunteers, and they don’t come much better than at Woodfordia. Heightening the experience just behind me was an almost two year old who was in paroxysm and frissons of delight and was joining in, improve-style, during the choral bits. 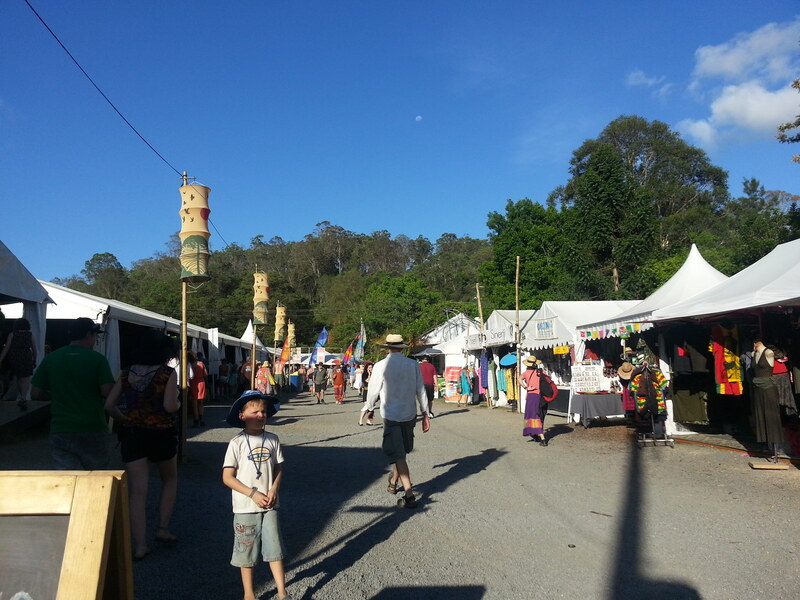 The three minutes of silence is a tradition that started back in 1999 at Woodford Folk Festival. A bell sounds several times at 11.30pm on New Year’s Eve, and across the site, tens of thousands of punters, stall-holders, musos, volunteers — everyone, really — fall silent. John Smith is performing at Woodford Folk Festival, and at the time of writing has just finished his last show at The Duck. While that’s bad news for anyone on site who missed his gigs, or for anyone who got along and just wants to see more, the good news for John is that he can now find a shady tree and try to keep cool for the rest of the festival. “This weather is too hot for my blood!” he observed to the lunchtime crowd of Duck Eggs, as he referred to them, in a friendly way. While pumping up the nachos at The Chef’s Table and their other gastronomical delights. Bill Quinn was phonetically challenged…. At probably my first Woodford Folk Festival, I got a treasured copy of the then very new The Next Turn album by Trouble in the Kitchen. As I set off down the D’Aguilar Highway on 3 January, processing eight days’ worth of festy wonderfullness, I was in an emotional, impressionable state, making listening to the 14 tracks all the more powerful. When I got to “Sarah Island” I was an instant, dribbling mess. One day, I parked my car under the Hyperdome in Canberra and went in to retrieve my copy of The Next Turn which I’d loaned to Frog from Songland Records for a listen. I was on my way to Numeralla Folk Festival and once more, the synapses were off in different directions. My vinyl collection is all gone, my CDs have been pared down to the absolutely definitely must keeps, and The Next Turn is in that large plastic vault, currently holed up in my one-metre-cubed existence in Kingsgrove, NSW while I have found the truth in my card from the federal government that says ‘No Fixed Address’. And I was battling to keep the camera on an even keel.